Game review by Dan Becker, 2002/06/09. Categories: card game, trick taking. Was Sticht? is a fun, trick-taking card game with many interlocking mechanisms. If you are comfortable with other trick-taking card games such as Spades , German Skat or Doris & Frank's Mü und Mehr , and you want to try a game with more pizzazz, then Was Sticht? may be the just the thing. However, be forewarned. Like some of Karl-Heinz Schmiel's other games, Die Macher or Attila come to mind, there are so many things going on that it may take a few games to get comfortable with the play. Either that or your brain will melt. The name Was Sticht? translates literally in English to "What Stings? ", but in German Stich is a loaded word with several meanings. For instance, regarding knives and such, a MesserStich is a stab or prick. 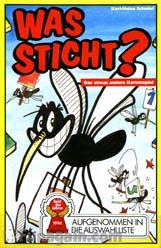 Regarding mosquitos, which adorns the box art and cards, a MückenStich would be a mosquito bite. Finally, regarding card games, a Stich is card trick. So now you know why many German games such as this and Frank's Zoo have happy, little, card-playing mosquitos. At the heart of the game is the basic trick-taking card play. There are 36 cards numbered 1 to 9 in four saturated colors which are easy to spot even for most color-blind players. One person leads a card. Others must follow suit if possible. If not, one may play a trump card to attempt to win the hand, or one may slough off a discard to attempt to lose the hand. O.K., sounds rather simple doesn't it, but let's now examine the crafty mechanisms that Karl-Heinz Schmiel has thrown in to make this one screw ball game. First of all, there are two trumps chosen randomly at the start of the round with the special trump-choosing cards: one colored suit card and one number card is selected. Number trumps are higher than color trumps. The card which is both the number and color is the über-trump, the highest card of all. Additionally the special trump-chosing cards contain a gray-color card and an x-number card which chooses no color and no number as trump. So quite interestingly, a hand might possibly have zero, one or two trump groups. Verstehen? Hopefully you are still with me. It gets twistier ahead. Second of all, rather than a plain deal of the cards at the beginning of a round, there is a card draft in which all cards are laid out and selected by the players. At first only the dealer knows which color and number are trump. Cards are laid in a 4 x 9 tableau, and each player chooses a card from the tableau. The dealer then looks at the four cards drawn and announces which play would have won the hand were it played. The first card-chooser is rotated, and the next set of four is selected with the dealer once again announcing the virtual hand winner. For example, Adam chooses a Green 5, Betty chooses a Red 1, Charles chooses a Green 9, and Diane chooses a Blue 4. The dealer announces that Betty's Red 1 would win the hand. Since the Red 1 won the hand, the players deduce that either Reds or 1s are trump. Since the 9 and 4 did not win, they may also deduce that 9s and 4s are not trumps. After a few rows, players usually deduce the trumps. This card draft is a fun game in itself. In the event of a tie in the number of chips, the chips are numbered in the sequence shown with the higher number chips being worth more. Presumably these goals are harder to achieve. If all players reach 5 chips, then the person with the highest sum wins the game. After the cards have been drafted, everyone except the dealer secretly selects a goal for the round. Once selections are made, all players reveal their goal for the round. If one player chooses "most tricks" and another chooses "fewest tricks", these goals mesh nicely, and there is the likelihood that both players will reach their goal. If two player choose "no tricks" then these goals are in conflict, and the two players will be battling each other during the round. Some goals are easy to attain. For instance, if you possess the über-trump card (the trump suit and trump number card), it is quite easy to save it for the last trick and take that goal. Other goals are difficult. The "exactly two", "exactly three", and "exactly four" are very hard since it is easy to under or over shoot the goal. Of course, it is always fun to make a player take a trick when they did not want it, especially if it has colors they don't need. The dealer does not select a chip, but tries to meet any of the goals displayed that round. If the dealer meets a goal AND makes the player miss that goal, then the dealer may score any goal chip of the player's choosing. So during a round, it is possible for all players to miss their goals or up to 3 players to achieve their goal. The tensions caused by conflicting goals is one of the most appealing aspect of this game. Each one of these elements is fun in itself. The basic trick-taking play is enjoyable, and in itself is a simple game that you could play with ordinary cards. Deducing the trumps is fun. Those who are good at logic may deduce the trumps earlier than others and use this information to draft better cards. The card draft is interesting and since it is done in the open, it is possible for an average card counter to remember all the cards in everyone's hands. As a middle to fair card player, I tend to count trumps and other cards in play which can beat my cards. One minor problem with the game is the sensitivity to the number of players. I've played with 3 or 4, with 4 players being the best, but 2 or 5 players is completely unplayable. We've often selected this game, had a fifth player come along, and then Was Sticht? goes right back into the closet. The game is also sensitive to player abilities. If you have a player who is new to trick-taking card games, or perhaps an inexperienced youngster, it is possible they will get trounced, not enjoy the game, and ruin the game for other more serious players. Also, a newer player who selects a set of tough goals at the beginning might be in for a torturous session. They might be fighting it and hating it for the rest of the game. However, given these caveats, players who are looking for a good trick-taking game with a little more oomph might love Was Sticht? . The interlocking mechanisms take a while to get used to, but the ways they affect each other is sublime. The goals affect the draft. The draft illuminates the trumps. The trumps determine the play. The play gets the goal. I've played many times, and I still enjoy the way the mechanisms work together. It's no wonder that this game was a nominee for the German Cirtics Press "Game of the Year in 1994. If you're a card player, give the game a try. Perhaps you too will be bitten by Was Sticht? Last modified: Thursday, 09-Jun-2011 12:37:14 MST.